There are many ways of describing the electronic behaviour in that region called a bond, one being the ELF (Electron localization function) technique, which certainly sounds as if it is describing a bond! The ELF function for the molecule above however was distinctly odd, and this was attributed to the Cr-Cr bond being not so much a covalent bond, but another (much less recognized type) known as a charge-shift bond. In particular, two of the ELF basin centroids did not occupy the central region between the two atoms, but had in effect fled that region, and in the process had also each split into two. 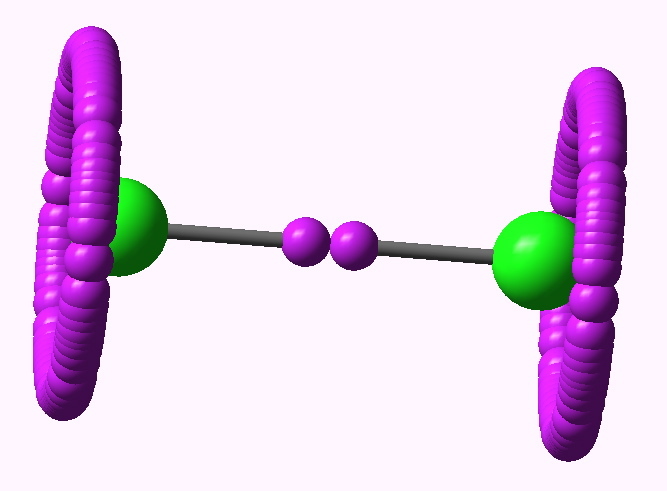 Other ELF basins did not much look like bonds, but retained much of their core-electron (i.e. non bonding) character. The issue now becomes whether the ELF method is sensible, or simply an artefact. In other words, it needs calibrating against other (homonuclear) molecules which might exhibit charge-shift behaviour. 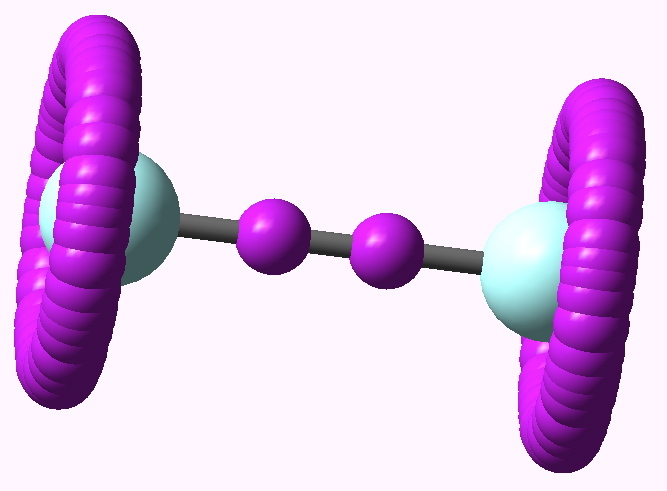 Three such molecules are in fact the halogens, F2, Cl2, Br2 as discussed by Shaik, Hiberty and co (DOI: 10.1002/chem.200500265). So lets take a look at what an ELF analysis shows for these, and how it compares with the chromium quintuple bond. At the B3LYP/6-311G(d) level, the ELF function shows the (valence) electrons located in two regions. 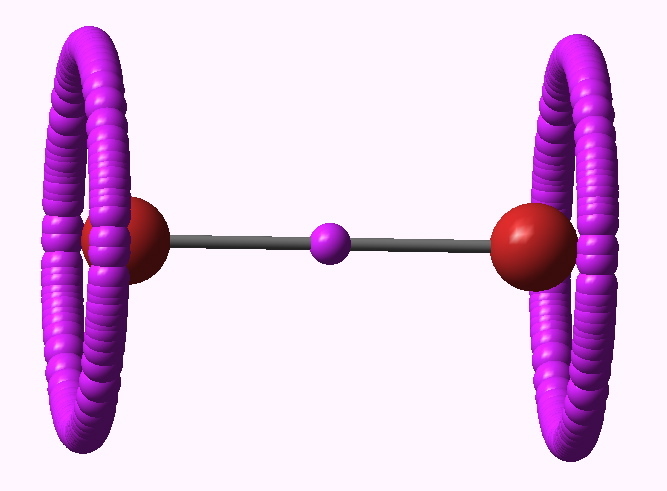 Firstly, what we might call the lone pairs are located in a torus surrounding each halogen atom (i.e. the molecule must be axially symmetric). The remaining electrons are in basins with centroids along the axis of each bond. The Br2 centroid is a single conventional disynaptic basin, with an integration of 0.77 electrons. With Cl2 however, something odd happens (and the effect was described in DOI: 10.1002/chem.200500265 ); the disynaptic basin splits into a close pair, each integrating to 0.33 electrons, and looking as if the two parts want to run away from one another. This was interpreted as indicating that the purely covalent description of the halogen bond is in fact repulsive and not attractive! The effect is enhanced for F2, with two very much split basins, each integrating to 0.08 electrons. This serves to remind us of how odd a bond the F-F one truly is (and how easily it is homolyzed)! Now that we have our calibration, does it match to the Cr-Cr quintuple bond? Very much so! Again, the valence basins show very low integrations (compared to the nominal bond order), and again they appear to have split and run away from each other. Most of the valence electrons in that species prefer instead to masquerade as core-electrons. So we can conclude that by the ELF criterion, the Cr-Cr bond is not quintuple, and not covalent but charge shifted. Of course, this does seem at odds with the Cr-Cr internuclear distance, which is indeed very short! This shortening probably arises from electrostatic attractions in the charge-shifted valence bond forms. It simply goes to show that what the nuclei get up to and what the electrons do may not be one and the same thing! This entry was posted on Saturday, February 20th, 2010 at 6:14 pm and is filed under Hypervalency. You can follow any responses to this entry through the RSS 2.0 feed. You can leave a response, or trackback from your own site. It seems my QM education is seriously failing me… charge-separation bond? Nice posts, really, really interesting! Yes, the traditional model is that a homonuclear bond in which one (or more) pairs of electrons are shared is called a covalent bond. If these electrons are transferred to one of the two atoms, we refer to it as an ionic bond, but this is unlikely to occur for homonuclear pairs. If however two valence bond forms where charge is transferred to one or the other atom in each are possible, then we have the charge-shift bond. This is a genuine new bond category, and arguably, it should be taught in all introductory chemistry texts. 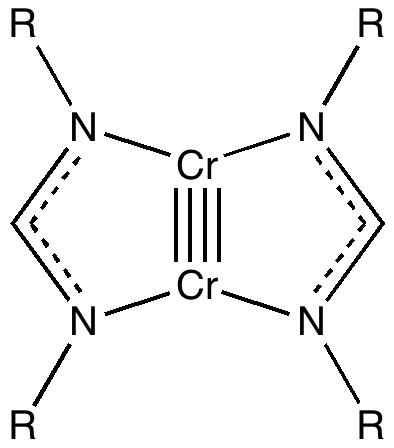 It does seem as if the (higher order) homometallic bonds (of which Cr-Cr is the best known example) do belong to this new category. Text-book writers, take note.